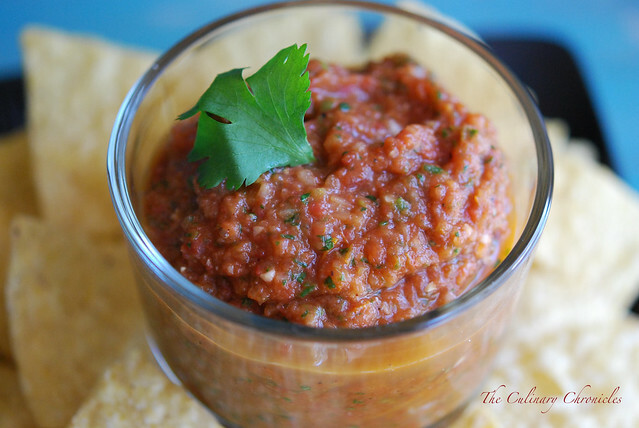 Oven-Roasted Tomato Salsa : Cinco de Mayo Countdown Begins! Alrighty Folks, it’s time to get organized because Cinco de Mayo is exactly one week away! What have y’all got planned? Is the menu set yet? Because if not–you’re in luck! For the next week I’ll be posting muy delicioso menu ideas to ensure that your Cinco de Mayo festivities will be filled with good eats and thirst quenching cocktails. To start off a fiesta, you’ve got to have chips and dips. 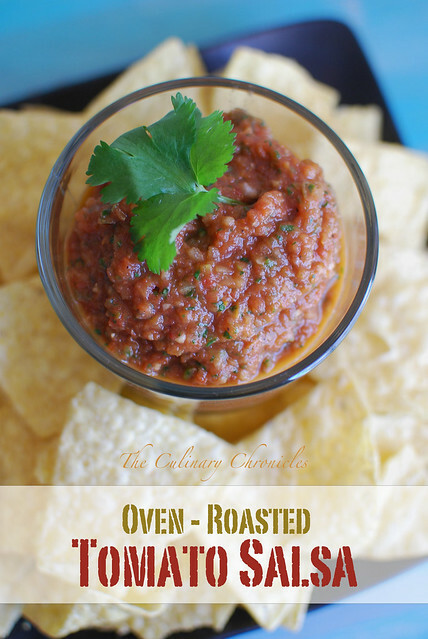 I recommend dunking your crispy tortilla chips into a Roasted Poblano Guacamole, Fresh Corn Pico de Gallo, or this mouth-watering Oven-Roasted Tomato Salsa. Because this gal is ALL about salsas. I usually make my standard salsa using canned plum tomatoes. It’s super easy to whip together (thank goodness for food processors!) and I smother everything with it. Over grilled proteins (fish, chicken, beef), inside tacos and burritos and of course–with chips. 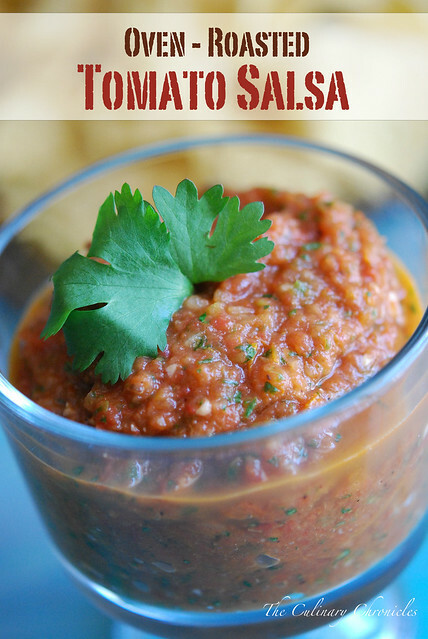 I decided to make a small tweak to my go-to salsa recipe by swapping out the canned tomatoes with oven-roasted tomatoes. 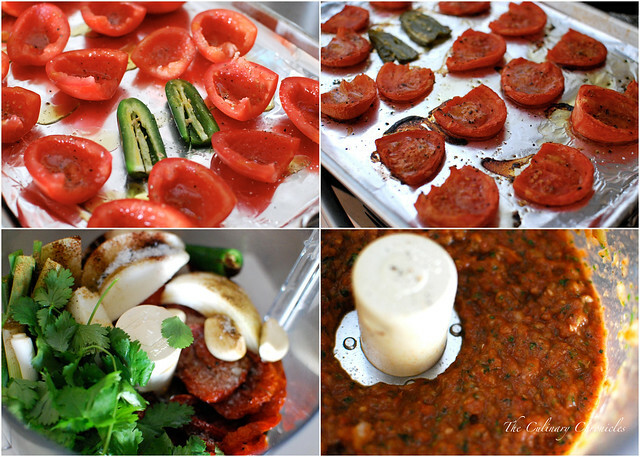 By roasting the tomatoes in the oven, it concentrates the flavor and adds a different layer to the salsa. It’s still easy to make but it does use a good amount of fresh tomatoes (they shrink through the roasting process) and you need to wait about an hour for them to get their roast on in the oven. The salsa can be kept in the fridge for about a week and actually tastes even better the day after you make it as the flavors have time to marry. But let’s be honest, you and your peeps will gobble down this salsa so fast that I doubt it will be in the fridge that long. And with that, let the official countdown to Cinco de Mayo begin!!!! Place the tomatoes and jalapeno in a single layer, cut side up, on baking sheets. Drizzle olive oil over them and sprinkle with kosher salt and black pepper. Roast for 60-70 minutes until the tomatoes have become slightly browned and shriveled. Allow them to cool until room temperature. Put the roasted tomatoes, jalapenos, ½ teaspoon of kosher salt and the remaining ingredients into the bowl of a food processor. Pulse until desired consistency. Taste the salsa and add more kosher salt and black pepper as needed. The flavors will intensify as the salsa flavors marry. Pour the salsa into a container and refrigerate for a few hours before serving. Previous Post Spring Risotto – Spring has Sprung!